Vessel Elan 394 Impression named Klara was produced in 2013. We propose this yacht from marina San Vincenzo just a few kilometers from Elba And Tuscany. Klara is licensed for 8 crew members. Layout of the yacht is 8 (6+2). Elan 394 Impression Klara has 3 bedrooms. For comfort of passengers there are 2 WCs. You can fill the fuel tank with 160.00 l liters and in tank for water it goes even 300.00 l liters. With motor 40 hp Klara can sail really fast. Klara is 11.90 m long and 3.91 m wide. Draft is 1.80 m. You can get other boats by navigating to the section Yacht charter San Vincenzo. Vessel's equipment includes : Autopilot, Plotter gps in cockpit, Mainsail with lazy jack, Bimini top, Dinghy, Anchor electric windlass, Bow thruster, Radio / cd player, Heating. . Nonrefundable caution is 2000.00 EUR. Choose our offer and enjoy your holidays on the deck of Klara. 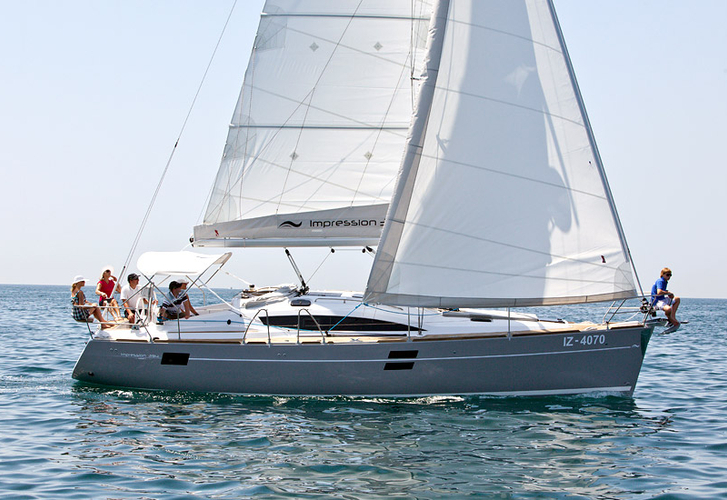 This Elan 394 Impression from San Vincenzo from Italy Click for in this section: Yacht charter Italy.